It’s finally getting a bit cooler in the northeast and when the temps drop, it can cause the skin to go a little haywire. A lack of luster, a hint of dryness, oil in places you don’t want it… all of these combine to create a perfect pain in the a%& to fix, amirite? 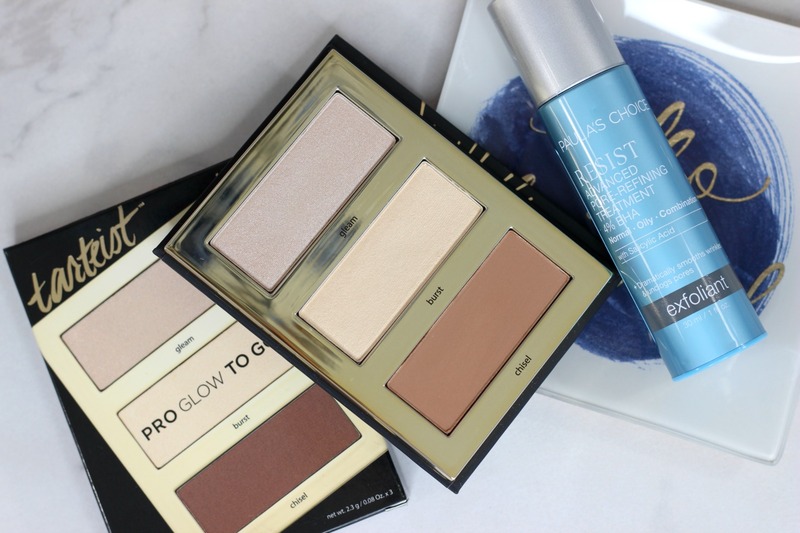 Today, we’re going to get into some makeup and skin care products to give you that healthy glow back. 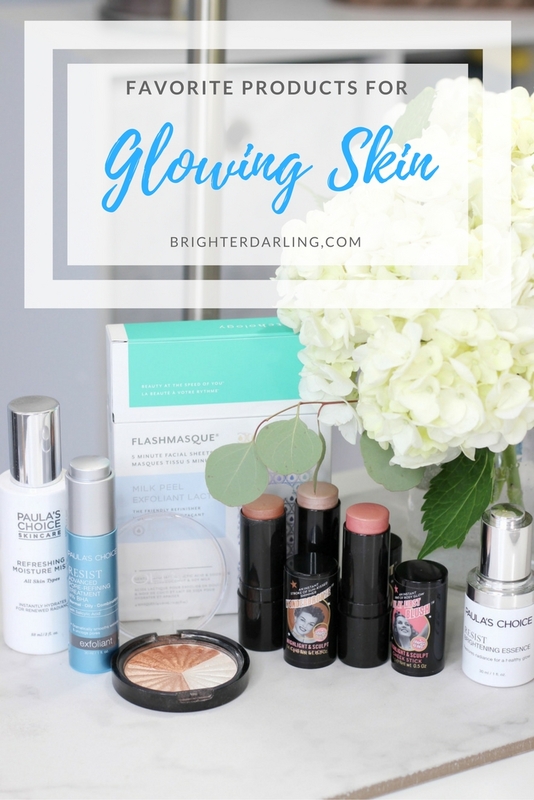 Grab a notebook and let’s get into my favorite products for glowing skin. Whether you have dry or oily skin, fall is a frustrating time for many of us to maintain balanced, healthy looking skin. I always recommend getting a facial at the beginning of any new season, so if you’ve never booked one before, it would be an ideal time! 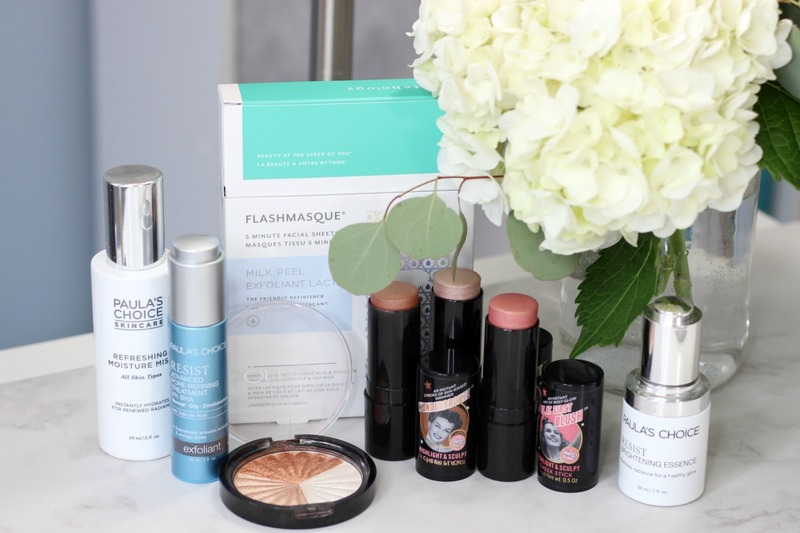 If you don’t have time for a facial, I’ll break down my latest favorites to get your glow back. I’m a HUGE fan of sheet masks to impart instant gratification and glow. I even wrote a whole blog post on my favorite sheet masks. But recently, I was introduced to the Patchology Flashmasque 5-minute Milk Peel* sheet mask. It gently exfoliates with Lactic Acid (one of the most gentle acids) and has soothing coconut and soy milk to calm. The 5-minute Milk Peel leaves no redness – just smooth, bright skin. EVEN BETTER >>> Patchology gave me a 20% off code for my readers! Use code MILKPEEL20 at checkout on patchology.com. Expires 10/31/17. Another instant fix is picking up a hydrating facial mist. It instantly hydrates without being too heavy on us oily ladies. For my sensitive skin readers, it’s also fragrance-free, cruelty-free and non-irritating (as is everything Paula’s Choice). I’ve been loving using this to ‘set’ my makeup as it instantly takes away that flat, powdery look. Serums are another way to add to your glow without dousing your skin in oils (shout out to the oily folks). 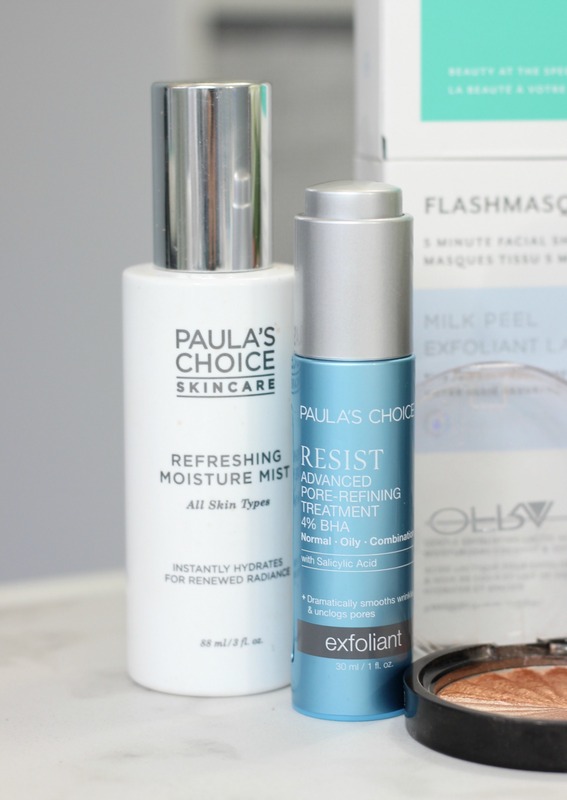 Paula’s Choice also released their RESIST Brightening Essence* to help restore radiance. I LOVE the water-gel texture and the fact that it’s loaded with Licorice Extract, Vitamin C and Niacinimide – ALL super skin brightening ingredients backed by science. If you’re a combination/oily skin type that struggles with texture, clogged pores, and overall radiance, you NEED to try this (and BHA exfoliants, in general). The Advanced Pore Refining Treatment dramatically smooths wrinkles and unclogs pores. I recommend using 1-2x/week for noticeable improvement after the first couple of uses. I definitely focused a lot on the skin care products because true glow has to come from within. If our skin isn’t smooth and hydrated properly, no makeup is going to look good. 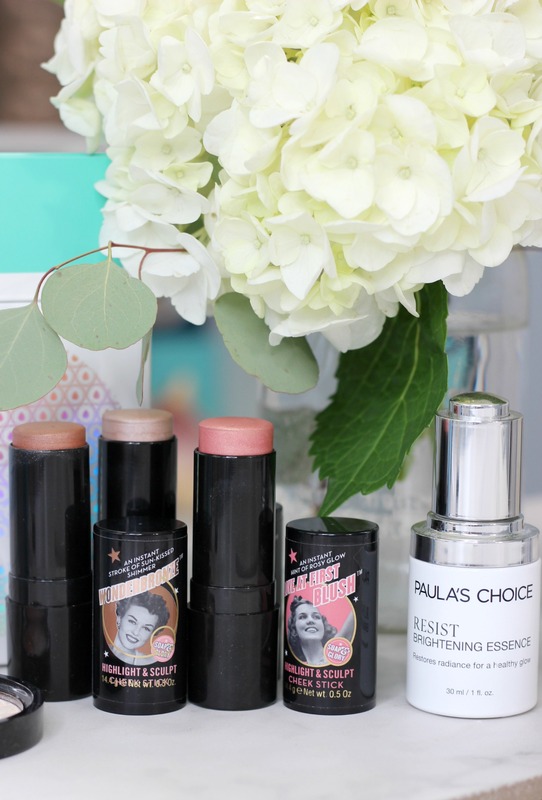 Lately, I’ve been using a couple of luminizing makeup products that have taken me by surprise. These remind me so much of the NARS Multiples (but a fraction of the cost). These blend incredibly well on top of foundation (and even powder) applied with simply a finger. Whenever I use these, I feel like I look so healthy looking. 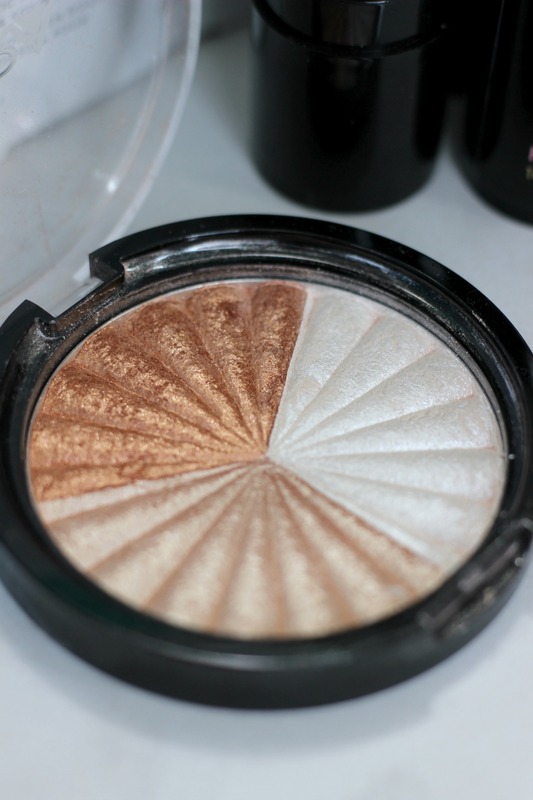 For those looking for a GLOW FROM SPACE highlight, look no further than the Ofra Highlighter in Everglow. I initially didn’t like this highlighter if you watched me first use it on YouTube. It kicks up a LOT of fall out when I run a brush through it. But I can’t deny the intense glow it gives and it lasts on my skin ALL.DAY.LONG. 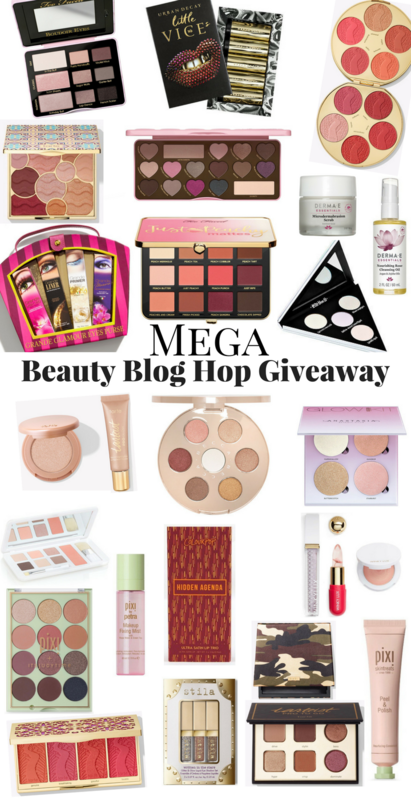 Today I’ve joined up with 34 other beauty bloggers to do a Mega Beauty Blog Hop GIVEAWAY! If you are unfamiliar what a blog hop is, it’s pretty simple. Each lady in the hop is giving away something beauty related. All of the prizes are from cruelty-free brands. You can click-through from one blog to another, entering the giveaways as you go. I recommend that you keep track of your entries by paying attention to the numbered list. You do not need to enter all in a single sitting. Come back and complete all entries by October 31st. CONGRATULATIONS TO MY WINNER! THANKS FOR ALL OF YOUR SUPPORT! Now continue on to the HOP! Brighter, Darling ***ME, YOU’RE HERE! Have any other favorite products for glowing skin you recommend? Help each other out and comment below or share with a friend! "Diorskin Forever Foundation Wear Test [YouTube]"
"Charlotte Tilbury Instant Eye Palette Review + Looks"